Glycans expressed on the forefront surface of cells participate in many key biological processes via forming various glycoconjugates. The recognition of complex glycoconjugates as mediators of important biological processes has stimulated investigation into their therapeutic potential. As the increasing accessibility of glycoconjugates, it has been widely applied in the field of drug delivery. This review particularly refers to the constitutive glycoconjugates of receptor-mediated binding of glycoprotein, glycolipids and glycopeptides for cell-selective drug delivery, in order to broaden the future therapeutic scope of drug delivery system and effective cancer therapy. Keywords: Drug delivery, glycoconjugates, glycolipid, glycopeptide, glycoprotein, targeting. Keywords:Drug delivery, glycoconjugates, glycolipid, glycopeptide, glycoprotein, targeting. Abstract:Glycans expressed on the forefront surface of cells participate in many key biological processes via forming various glycoconjugates. The recognition of complex glycoconjugates as mediators of important biological processes has stimulated investigation into their therapeutic potential. As the increasing accessibility of glycoconjugates, it has been widely applied in the field of drug delivery. 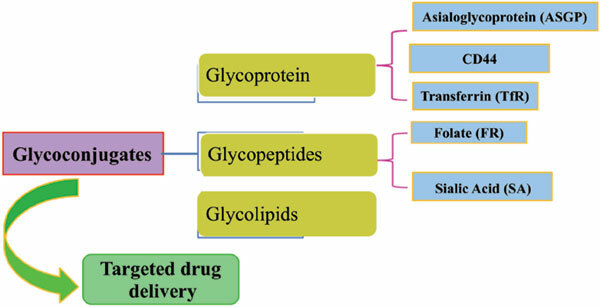 This review particularly refers to the constitutive glycoconjugates of receptor-mediated binding of glycoprotein, glycolipids and glycopeptides for cell-selective drug delivery, in order to broaden the future therapeutic scope of drug delivery system and effective cancer therapy.